After her sophomore year, C. Jane Taylor dropped out of Champlain Valley Union High School. She started college the following fall at Simon's Rock, then known as Simon's Rock Early College, where she studied music and literature. In the three-plus decades since Taylor graduated from college, she's held a wide variety of jobs — from welder to web designer. 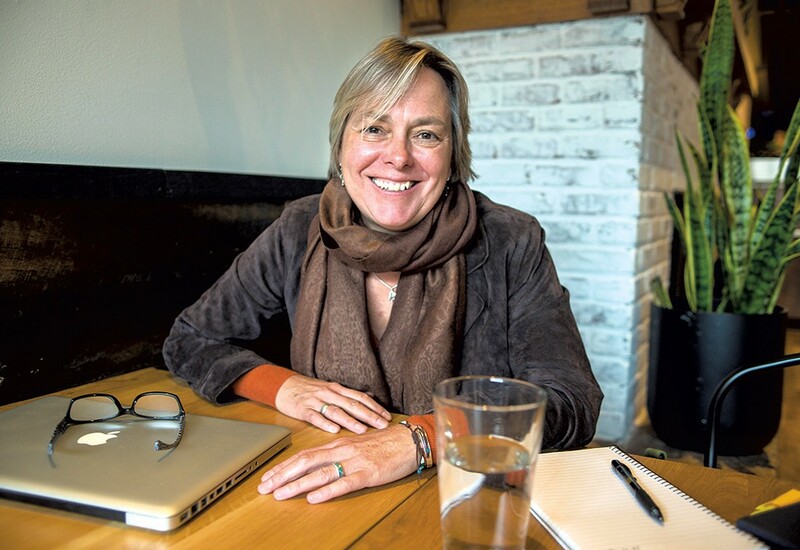 These days the 54-year-old Hinesburg resident is a career communications coach at FromWithin Coaching in Burlington, where she draws on her own nonlinear path to help her clients find meaningful work. Her area of expertise: writing résumés, cover letters and LinkedIn profiles that help clients stand out in the hiring process. Taylor and her colleague Lindsey Lathrop-Ryan will be giving tips to experienced workers looking for a change in "Reinvent Yourself," a workshop on Friday, October 19, at the Vermont Tech Jam. The career-and-tech expo attracts job seekers and career changers looking to break into lucrative tech fields. In advance of her session, Taylor talked with Seven Days about her careers and how she helps people transition to ones that are meaningful to them. For starters, "keep learning," she says. "It's the thing that keeps me alive. I have a vigorous, exciting life because I'm always learning new things." SEVEN DAYS: You've changed careers a few times. Can you describe your employment history? C. JANE TAYLOR: It's funny, I've had many different careers, but writing has been the thread running through all of them. I worked as a cook, I had my own welding business, I worked for an alternative energy company. I worked at Stone Environmental, an environmental consulting firm [in Montpelier], and I was in marketing there. I worked as a sculptor's assistant with Kate Pond for a couple of years. She did a world sculpture project, and I did writing for that project and welding, which was a pretty interesting combination. After Stone Environmental, my husband and I started a little internet web boutique [business]; we made websites for a couple of years. I worked at Union Street Media as a writer; I was a founding member of its SEO department back when Google Analytics was born. SD: What techniques and approach did you use to make those changes, and what propelled you to make them? CJT: With the welding job, I saw somebody in their garage when I was a young new mom, single and unemployed. And I saw that light in the garage and I thought, I need to do that. And then I signed up for Step Up for Women, and I learned how to weld. I started my own welding shop and learned different welding techniques, and ended up doing a lot of piecework for craftspeople in metal work. I went from having my own [welding] business to working for someone else. Moving from welding to writing was a bigger jump. The thing that I've often done is get out a legal pad, draw a line down the middle, talk about the things I love to do, and then figure out where I can do those things. SD: How do you persuade a reluctant or uncomfortable self-promoter to become a bold one? CJT: The way I do it is by interviewing them to discover the interesting and compelling things about them. And when I learn what those things are, I'm able to turn it around and show it to them. I become a mirror. I usually do this when I'm writing someone's résumé or LinkedIn profile or CV. Part of this technique comes from yoga, and that is, I'm able to see the good first. It sounds sort of Pollyannaish, but it's real. I'm able to see the passion, the drive, the excitement, the talent and the skills that my clients have in a way that they might not recognize on their own. SD: What are a few practical tips for selling oneself in a cover letter or résumé? CJT: Here's my most exciting tip: Instead of using your résumé as a history of what you've done, look at it as a document that describes what you want to do, what kind of career you want to enjoy. It has some of the same information — you need to know you have a bachelor's degree, you want to have work experience in your résumé — but turn it around in such a way where you start your résumé talking about the incredible and unique talents that you have. For shy people or people who are self-deprecating, think about what your best friend or your mom would say about you. Come at it from a different approach. The other thing is that celebrating your strengths is not narcissistic. The thing that you're trying to do is help the organization or the company you're applying to be more successful. If you look at the job application as something that is going to help your community, then it's a little bit easier to say great things about yourself. The style of résumé I prefer for a mid-career person is a functional résumé. It highlights your skills and talents rather than your chronology. SD: What are the particular challenges older, experienced workers face when rejoining the workforce or shifting careers? CJT: Ageism is real, and that's a problem. Even though it's illegal to judge somebody based on their age, people do it all the time. [One] thing that employers fear, when hiring somebody over 50, is that that worker isn't up with the times, that they don't understand technology. One thing I recommend for people reentering the workforce, especially if they're in their forties or fifties, is to learn some new stuff. It shows you can learn new stuff, and it also shows some interest in your particular industry. SD: Can you share the story of one or two clients who have made successful career transitions in their forties or fifties? CJT: I recently worked with a woman who is in her middle sixties, and she just got a master's degree. She had the same [employer] for 40 years, [with] a bunch of different jobs within this company. But she got to a point where she was, like, "I need to have something in my life that's different." The résumé that she and I put together was like a blueprint for the rest of her life. The work that we did together turned her résumé into a guiding document that she's using. And it was pretty fabulous for her to leave this job that she'd been at for 40 years. She took that foundation and moved it from her [former] company to this exciting new field. SD: Your husband, John McConnell, is a yoga teacher. If he told you he wanted to become a software developer, what advice would you give him? CJT: It's kind of ironic that you said that because he has five older brothers and they're all in tech. I would look at job descriptions in IT and try to figure out what kind of person has this job. What kind of personality does it take to do this job? Is that the kind of personality you have, is that something that would make you happy? At the end of the day, having a job that makes you happy is pretty much the most important thing. The original print version of this article was headlined "Work It"